Astell & Kern introduces AK240 Blue Note 75 Limited Edition | What Hi-Fi? In celebration of the fact that it's 75 years since the Blue Note Records jazz label was founded, Astell & Kern has revealed that it will be producing 1000 Limited Edition AK240 high-resolution music players. 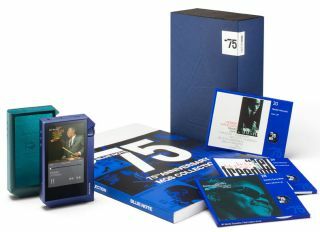 The Limited Edition version of the portable high-res player will come pre-loaded with 75 Blue Note albums in studio master quality audio - 24-bit/96kHz and 24-bit/192kHz. The albums range from Thelonious Monk's first sessions in 1947 all the way through to 2014 with Gregory Porter's album, Liquid Spirit. Each of the 75 albums will also come on a microSD card and will be packaged in unique cases that fit into a supplied, flexible display stand. A 100-page book completes the package and provides listeners with information on the 75 albums. Meanwhile, the player itself will sport a blue finish and come with an accompanying leather case. In addition, the specific limited edition number from the 1000-strong run will be engraved into the player and its display stand. A recent firmware upgrade for the AK240 means that you can now use the device to stream music. Your tracks can be accessed from the player itself, a computer or a NAS drive, with a wide range of file formats supported. The Astell & Kern AK240 Blue Note 75 Limited Edition package will be available from late October from specialist resellers and can be yours for £5000.